How many Ga atoms are connected to one As atom in solid gallium arsenide? Arsenic is shown making five covalent bonds to neighbouring gallium atoms. Here, arsenic is shown making four covalent bonds to neighbouring gallium. Which source is correct? Please give appropriate references or experimental proof. It is quite well established that stoichiometric gallium arsenide (CAS 1303-00-0) forms a zincblende analogous structure. It consists of two stacked face-centered cubic lattice systems (Ioffe Physical Technical Institute database). See also Uncle Al's Answer. In other words, the arsenic forms the lattice and the gallium fills half of the tetrahedral positions (and vice versa). Therefore every gallium has four arsenic nearest neighbours. Besides the elemental semiconductors, such as silicon and germanium, some binary crystals are covalently bonded. Gallium has three electrons in the outer shell, while arsenic lacks three. 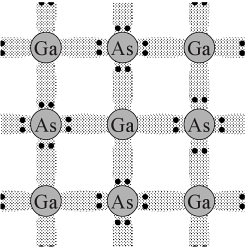 Gallium arsenide (GaAs) could be formed as an insulator by transferring three electrons from gallium to arsenic; however, this does not occur. Instead, the bonding is more covalent, and gallium arsenide is a covalent semiconductor. 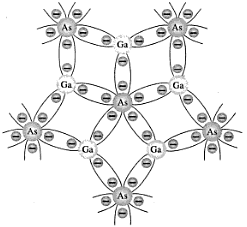 The outer shells of the gallium atoms contribute three electrons, and those of the arsenic atoms contribute five, providing the eight electrons needed for four covalent bonds. The centres of the bonds are not at the midpoint between the ions but are shifted slightly toward the arsenic. Such bonding is typical of the III–V semiconductors — i.e., those consisting of one element from the third column of the periodic table and one from the fifth column. Elements from the third column (boron, aluminum, gallium, and indium) contribute three electrons, while the fifth-column elements (nitrogen, phosphorus, arsenic, and antimony) contribute five electrons. 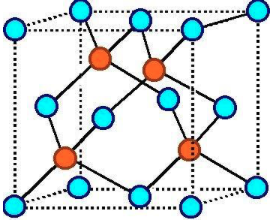 All III–V semiconductors are covalently bonded and typically have the zincblende structure with four neighbours per atom. Most common semiconductors favour this arrangement. This is still a fluorishing field for researchers in the field of materials design semiconductors, semiconductor lasers, computational physics/forcefield development, and more. The book "Electronic Devices and Circuit Theory" clearly gets it very wrong. I had a look into it and noticed they also argue with the Bohr model, which might not be a very good starting point at all. However, the focus of the book is clearly not solid state chemistry, and therefore it might fit the purpose. The two-dimensional representations you have given are inadequate and should not be taken too seriously; crystal structures are nearly always three-dimensional. Gallium arsenide has the cubic zincblende structure, shown below. Here, blue atoms can are Ga and orange atoms As (it can be the other way round, too, as these atoms are related by symmetry). Both gallium and arsenic have coordination number 4; the coordination geometry is tetrahedral about both. In fact, 5-fold symmetry is very rare in crystals (see quasicrystals for more information). The somewhat standard reference (~1800 citations in Google Scholar) for bulk GaAs structure is a 1982 paper by J. S. Blakemore: J. Appl. Phys. 53, R123 (1982). The experimental/numerical data in it (via X-ray diffraction) establishing the crystal structure of bulk GaAs goes back to the 1960s though. One of the more helpful visualizations of zincblene structure (which bulk GaAs shares) can be found on YouTube. Note however that nanowire GaAs can have wurtzite structure as well; here is another YouTube animation. Nanowires weren't practical in the 1980s, so this is more recent research; see for example S. Conesa Boj's Masters thesis at the University of Barcelona, "HRTEM assessment of Wurtzite and Zinc-Blende phases in GaAs nanowires for optoelectronic devices". (HRTEM is explained well enough on Wikipedia, in case you wonder how that works). In any case, the coordination numbers are still 4 for both Ga and As in this structure. In both cases (crystal structures) the ratio of the Ga:As atoms in the unit cell is the same 1:1. I've actually checked the 11th (2012) edition of Boylestad & Nashelsky and they have the same old explanation. My guess is that they don't want to explain polar bonds to first-year EE undegrads, so they engage in some "lies to children" by sticking with the simplified covalent bond model. The book by Razeghi (which gives the right ratio and explanation for bulk GaAs) does call them "polar covalent bonds"/"mixed bonds" (pp. 65-66), but from its preface this book seems aimed at senior-level undergraduates. Razeghi does mention prior to that in his book (p. 30) that GaAs has the zincblende structure, and goes into some detail on that. The flattened 2D structure on p. 66 is a bit strange in view of that prior level of detail; I'm guessing he wanted to emphasize the bond polarity (on p. 66) and he thought 2D was a simpler way to show it. If you extend the drawing in figure 1, you will discover that there are 5 Ga ions for 3 As ions. This would be suitable for a alloy. Since you are probably interested in a semiconductor, the arsenic needs to have a formal charge of -3. This means that the ratio of Ga to As will be 1:1. Not the answer you're looking for? 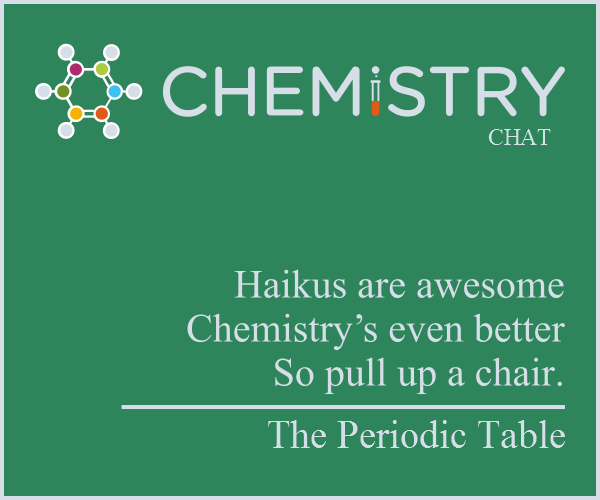 Browse other questions tagged inorganic-chemistry crystal-structure erratum or ask your own question. How many p-orbitals are there in each period? How many Au atoms can be extracted from 0.250 L of seawater? Cubic lattice: How corner atom of a cube is shared by 8 atoms? Why are so many ionic compounds brittle? What are unit cells, and how do you determine the number of atoms in one of them? How many significant numbers(figures) are in repeating decimal (105-32)×5/9=40.5555…? How many resonating structures of Carbon Monoxide are there? How to prepare elemental gallium from a mixture of gallium and aluminum nitrate?